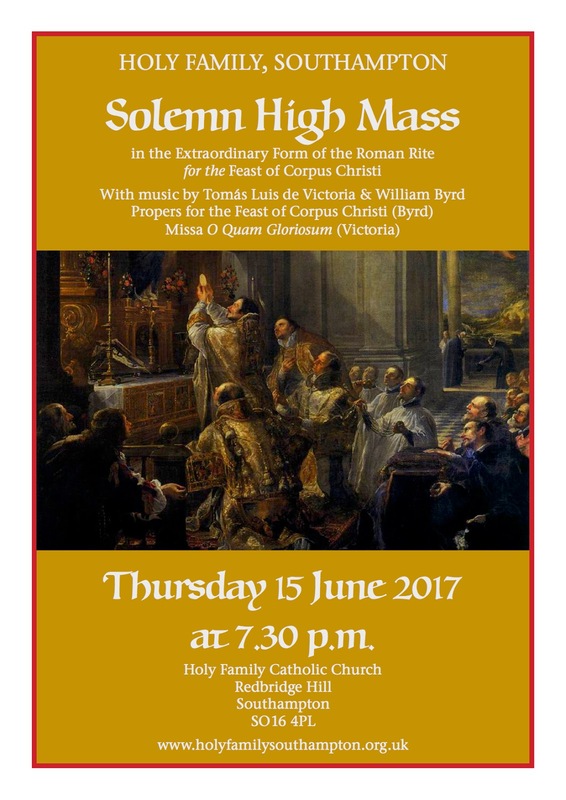 A Solemn Mass in the Extraordinary Form will be celebrated at Holy Family, Southampton, in the Diocese of Portsmouth, England, for the feast of Corpus Christi on Thursday, June 15, at 7.30 p.m. The music for the Mass will include Victoria’s Missa O Quam Gloriosum and the complete polyphonic propers for Corpus Christi by William Byrd. The celebrant and preacher will be Father James Bradley, Priest in Charge and Chaplain to the University of Southampton, who is a Priest of the Personal Ordinariate of Our Lady of Walsingham.